The many visitors on our stand at the Enada Rimini show have been favourably impressed by the “Argo” app that makes it handy to control from the smartphone the change machines. Interest has been aroused also by two new products: the “Land” money changer, and the Tower Lights for gaming machines. "Also this year we have chosen to exhibit there and the hundreds of visitors who have trodden our stand have proved us we have been right" declares Fabrizio Alberici, CEO Alberici, returning from the fair Enada Spring just held in Rimini. "We talk to our customers to understand how to keep developing new products: thanks to our indoor design and production departments, we can react quickly to market inputs". And the feedback from the Rimini show has been especially positive with regard to the “Argo” app, that allows to control the change machines from a distance. 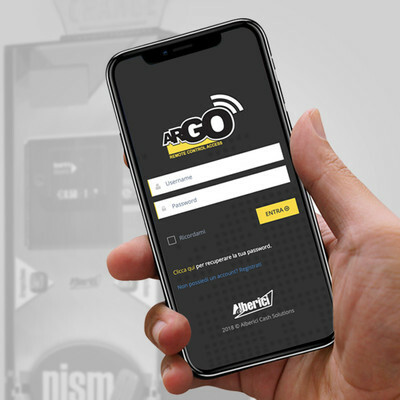 The Argo app remotely monitors the money changers and cross-changers and lets you know exactly when to collect or refill the cash money, or why and when to service the machines. The app notifies the owner when the cash stocked would exceed the minimum or the maximum pre-settable thresholds. It provides as well detailed reports about the amounts collected and paid. The GPS anti-theft geo-location is an important additional function, that warns when the machine has been removed from its position and tracks its itinerary. the Tower Lights designed to be placed on top of the gaming machines, to attract the players’ attention or to signal events in the game or the status of the machine itself – available even in the original elliptical version.